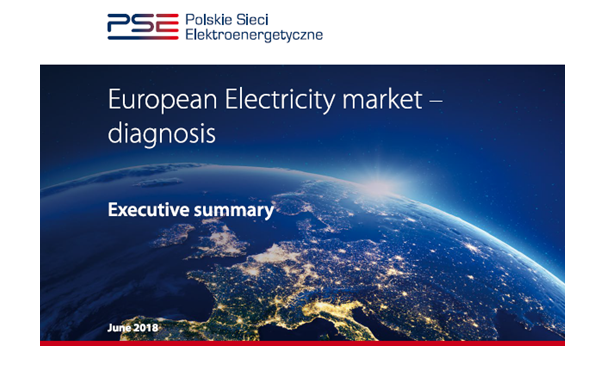 “The European Electricity Market - diagnosis” is the first of the series of PSE’s publications concerning the European electricity market. It aims at initiating a comprehensive discussion on the energy market – its current design inefficiencies and future architecture. Today the actual delimitation of zones was made taking into account mainly the existing administrative boundaries coinciding with state boundaries, with a few exceptions, and not an analysis of transmission capacity within them. Due to political rather than technological reasons, zones are difficult to change in order to optimize their configuration. Moreover, the network representation in the zonal model is highly simplified, causing detachment of market and system operations (depending on the physics). In the opinion of PSE, European market outcome within large bidding zones is often physically infeasible, requiring TSOs to take a large number of out-of-wholesale-market remedial actions aimed to ensure the secure operation of the system. The scale of these actions may lead to a serious reduction of the operational security margin of the transmission system. The trade can take place under energy-only market formula, where energy and capacity are traded in a single market process (like today in most European countries) or an energy-plus-capacity market, where the market processes for energy and capacity are separated. There are justified concerns that future price signals on an energy-only market will not create the conditions for functioning or deployment of all stable generation sources necessary to ensure the operational security of the power system, which may result in generation outages in the future. Moreover, in reality, the energy-only market does not provide correct signals for investing in the network development, which may lead, in some cases, to oversizing investments. Consequently, in the opinion of PSE, energy-only market is not suited to the technological and business challenges faced today by the sector. It is intended as another tool to enhance supra-national market integration. Unfortunately, nowadays it contributes to growing problems in the system management, which arise from the contradiction between the fundamental feature of the zonal model, i.e. the “copper plate” assumption, of unlimited transmission capacities and trading possibilities within each bidding zone, and the preference for cross-zonal transactions, which are technically limited by cross-border capacities. In reality, underutilization of cross-border infrastructure is mainly due to zonal market imperfections, particularly loopflows i.e. “power flows leaving and re-entering the given bidding zone without being scheduled”. Increasing loopflows impact the secure operation of the interconnected system and may prevent the accomplishment of the goals of the EU’s energy policy. This problem cannot be solved by any regulations that artificially increase the cross-zonal capacities and in effect will create only artificial exchanges. In the forthcoming publications, PSE will present the outline of the future market design, responding to the new challenges pointed out in the Diagnosis and founded on four fundamental pillars: economic efficiency, system security, incentive compatibility and market transparency.